From the Philippines straight to your heart. I have this friend who makes knives. Hear me out. I’m going somewhere with this. See, he used to work for “The Man” doing complicated computer stuff that I couldn’t even begin to understand. Then he and his wife had a conversation about what he’d really want to be doing with his life, and his answer was that he wanted to make knives. Since his wife is also a Maker by nature and their budget allowed them to do that, he makes knives now. Like, truly amazing knives. Now, the other day he and his wife were checking out this new Asian grocery that opened up near us, and they chanced upon the candy aisle. 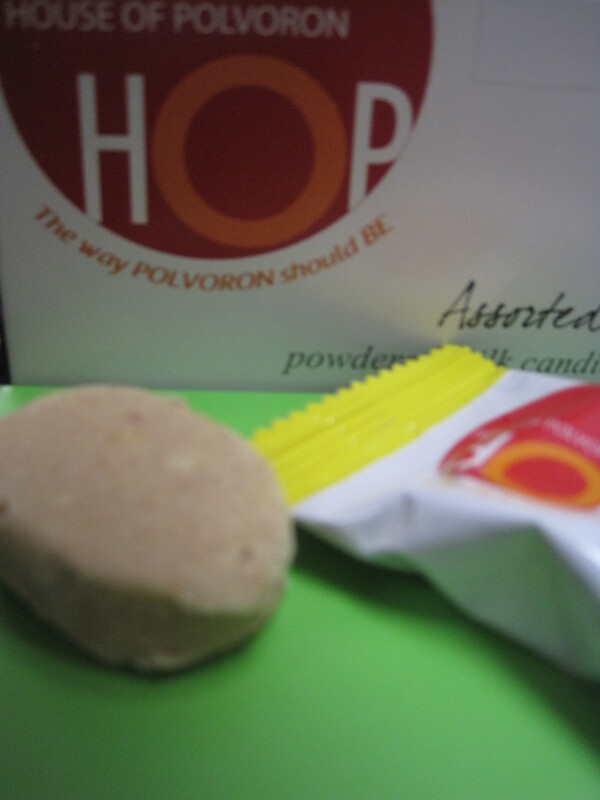 Knowing my Fringe Candy geekery, they picked up a little something for me–a sampler pack of Polvoron from from House of Polvoron in the Philippines. The interesting thing is that despite being on the candy aisle I’d normally hesitate to call it Fringe Candy for two reasons. For one, in many ways Polvoron is more of a cookie than a candy. And two, it’s only “Fringe” from my admittedly limited cultural perspective. In other parts of the world, Polvoron is part of a rich tradition that dates back a long damn way. From polvo, the Spanish word for “dust,” Polvoron appears to have originated in the Levantine culinary tradition of Syria, Lebanon, Jordan, Palestine, Israel, and parts of Turkey. It traveled across northern African and into Spain during the expansion of the Caliphate in the early 8th century where it took root in the Islamic culture of the Iberian Peninsula for roughly 700 years, give or take. Currently, there are over seventy factories in Spain alone that manufacture Polvoron, and there are variations on the recipe around the world. The Mexican wedding cookie is a more cookie-fied version of the same concept, while in the south of Texas they make Pan de Povo which is essentially Polvoron with anise. Imagine the most crumbly shortbread you can. Can you do that? Now imagine it even more crumbly, by a factor of ten or so. Made of flour, sugar, powdered milk, and nuts with just enough oil to hold it together (olive oil in some instances, but beef or pork fat in others–check your ingredient lists if you’re vegetarian or Kosher), a Polvoron is a bite-sized piece of goodness with the texture of a fresh sand castle. They’re delicate and not too sweet which is a huge plus for me. The Filipino take on the recipe uses a larger proportion of powdered milk than the Spanish version, and that’s the one I tried. Made by House of Polvoron, it started in 1987 with an old family recipe that was fiddled with until it was perfect and then tirelessly hand-delivered. The whole family took part in the company’s growth, building it into the international brand it is today. The sampler I tried featured the Classic, Crisp Rice, Cashew, and Cookies & Cream. Each was distinctive and delicious. But again, not really quite like candy. There was something like a raw cookie dough quality, something delightfully…unfinished about them. Of the ones I tried, the Cookies & Cream was the sweetest, but even that was restrained. The rich nuttiness of the Cashew was my absolute favorite, but I’d readily enjoy any of them again. I’m tempted to seek out the Purple Yam or Green Tea flavors for comparison. And for chocolate geeks, they even do a chocolate covered variety that I imagine not only be sweeter but also more candy-like. If you can find them, they’re well worth checking out, both for flavor and for a chance to dip your toe in some rich history and culture. But treat them gently because they’re fragile as hell. If you’re not careful you’ll just be sucking sweet sand out of a foil packet. And if anyone can find the Texan Pan de Povo, can you hook a brother up? Those sound excellent. We, the Chinese, have a cookie just like this that I’ve been buying and enjoying all of my life. And, yes, you are right, it is ubiquitous and not a candy – at least we don’t think of them as such.